Commemorative coins are specifically designed to record and honor important events, people and places. In ancient times they were also used to disseminate news throughout the country. Just about every nation throughout recorded history has issued commemorative coins. In modern times some coins are made to circulate alongside regularly issued coins and others are specifically minted for coin collectors. In a more general sense, especially in non-U.S. coins, a commemorative coin is a circulating coin that commemorates a certain person, place, or event. Commemoratives are usually only issued for one year, although they are sometimes extended, and they are characterized by the fact that they deviate from the "normal" or regular issue coins. A commemorative coin, in U.S. coin collecting, is usually understood to be one of the special non-circulating coins issued by the U.S. Mint, and which are sold to collectors at prices substantially above face value, and which include surcharges that support a program related to the subject of the coin. For example, part of the purchase price of the San Francisco Old Mint commemorative coins went to fund the establishment of a museum in the San Francisco Old Mint building. Sometimes commemorative coins end up becoming regular coins, as in the case of the U.S. Lincoln Cent and Washington Quarter. Both coins, when first issued, were meant to be one-year circulating commemoratives, but the public liked them so much that the Mint continued issuing them. In fact, they are still being issued to this very day. Commemorative coins in the United States must be approved by Congress via the Committee on Banking, Housing, and Urban Affairs and the Committee on Banking and Financial Services. Additionally, the the topic for the commemorative coin issue can be recommended by the Citizens Coinage Advisory Committee. The first commemorative coin in the United States was minted in 1892 to commemorate the World's Columbian Exposition. From that point forward many silver and gold commemoratives were issued mostly for special interest groups that influenced Congress. The last classic commemorative coin was issued in 1954. In 1982 Congress once again began to approve the issuance of commemorative coins with the George Washington 250th Anniversary of Birth commemorative half dollar. Quickly the abuses that stopped the classic commemorative coins took root again with the issuing of many different coins to support a variety of causes. Beginning in 1998, Congress passed a law that no more than two subjects per year will be chosen for commemorative coins. 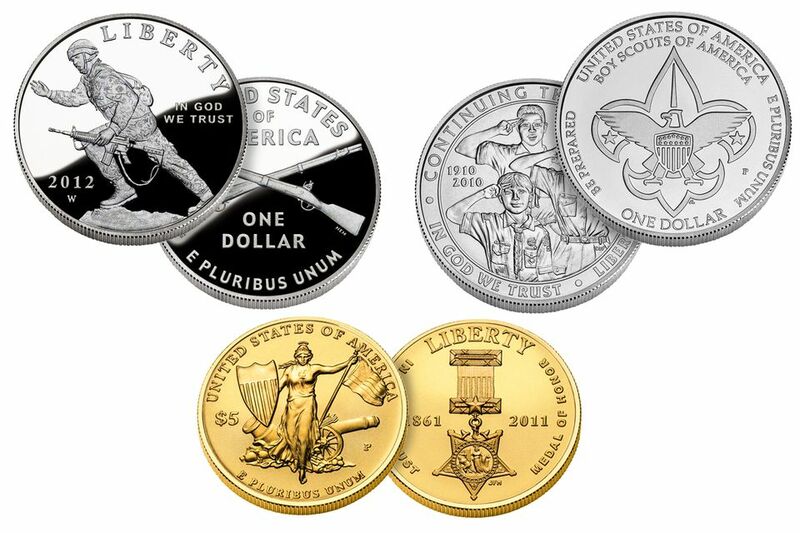 Today just about every coin produced at The United States Mint commemorates something. From the penny that was first issued to celebrate the 100th anniversary of the birth of President Abraham Lincoln to the America the Beautiful Quarters that commemorate national parks throughout the country to the Presidential Dollars that commemorated every deceased president since George Washington. The wide variety of subject matter on commemorative coins means that any coin collector can find something of interest to collect. From the popular 2014 Baseball commemorative coins to the obscure 38th Anniversary of the End of the Korean War commemorative dollar there is something there for everyone. Commemorative coins are most popularly collected by types and in the original mint-issued packaging. Additionally, if a coin is produced in more than one finish (uncirculated and proof) most collectors will choose to collect only one type of finish. Some more advanced collectors will collect all variations and mintmarks. Currently, the United States government selects two topics to be commemorated each year. This law is in response to the abuse of commemorative coins during the classic commemorative period of 1892 through 1954. During this time, political abuse resulted in such coins that featured P.T. Barnum and commemorating nonexistent features such as the Cincinnati Music Center. The final straw was the 1996 Atlanta Olympiad commemorative coin series that featured over thirty-two different coins and finish combinations. When most people think of commemorative coins, they think of the specially-struck non-circulating coins sold at a premium by the U.S. Mint, which are meant to raise funds for a particular purpose. However, countries around the world issue commemorative coins.